Hamas says it needs 110,000 trucks to rehabilitate Gaza completely - but just 4,600 built a terror tunnel network. 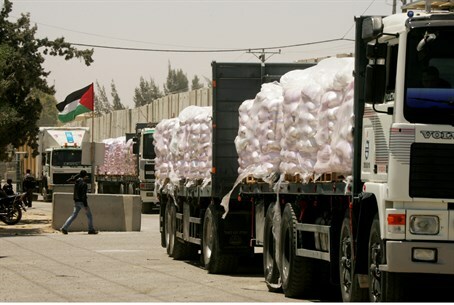 Twenty-eight trucks of cement entered Gaza Tuesday, Hamas officials told AFP, in the second shipment of construction materials for the "private sector" since Operation Protective Edge this summer. Raed Fatuh, the Palestinian Authority (PA) official in charge of the entry of goods into Gaza from Israel through the Kerem Shalom crossing, said 28 trucks, each carrying 40 tonnes of cement, had crossed into the enclave. It was the first delivery of building materials for the private sector since October 14, when 75 trucks entered Gaza, carrying 1,300 tonnes of material - 15 trucks of cement, 10 of metal and 50 of gravel. "This is the biggest delivery of cement since the war ended," Fatuh told AFP. "But it is not enough, it is only a tiny amount for the reconstruction." He also claimed there had been no further deliveries since October because Israel had halted the process over concerns about how the materials had been used. However, at least one delivery was confirmed to the region just last week - a shipment from Hamas-linked Qatar, which was likely bound for the Hamas-run "public sector." Further, Fatuh claimed that people were unable to make use of cement delivered in October as UN chief Ban Ki-moon visited on a sympathy trip. "Most of the people who got cement last time need money from either (the UN) or the government in order to buy other materials to use with it," he said. It is unclear why Gaza is still strapped for cash, after the UN and international donors pledged $5.4 billion to Hamas less than two months ago. Palestinian officials also say at least 100 trucks of building materials a day are needed to complete the reconstruction of Gaza within three years - some 109,500 trucks of materials. "There will be no reconstruction here if the mechanism stays like this. It will take 20 to 30 years," another Palestinian official told AFP, on condition of anonymity. Hamas has already threatened another war if Gaza were not "rehabilitated" from Operation Protective Edge this summer - a war against Israel which Hamas itself both started and used civilian areas as a base for conflict.